In animals, one can usually distinguish 4 stages of embryonic development. Mitosis and cytokinesis of the zygote, an unusually large cell, produces an increasing number of smaller cells, each with an exact copy of the genome present in the zygote. However, the genes of the zygote are not expressed at first. The early activities of cleavage are controlled by the mother's genome; that is, by mRNAs and proteins she deposited in the unfertilized egg. In humans, the switch-over occurs after 4–8 cells have been produced; in frogs not until thousands of cells have been produced. Cleavage ends with the formation of a blastula. There is little visible differentiation of the cells in the various layers, but probes for cell-specific proteins reveal that different groups of cells have already started on specific paths of future development. Gastrulation forms three major "germ layers": ectoderm, mesoderm, and endoderm. By gastrulation, the genes of the zygote genome are being expressed. View these stages as they occur in amphibians such as Xenopus laevis, the South African clawed frog. In time, the cells of the embryo differentiate to form the specialized structures and functions that they will have in the adult. They form neurons, blood cells, skin cells, muscle cells, etc., etc. These are organized into tissues, the tissues into organs, the organs into systems. After all the systems are formed, most animals go through a period of growth. Growth occurs by the formation of new cells and more extracellular matrix. genes encoding the enzymes of glycolysis. However, every cell descended from the zygote has been produced by mitosis and thus contains the complete genome of the organism (with a very few exceptions). Dolly. Dolly is the sheep that was formed by inserting a nucleus from a single cell of an adult sheep into an enucleated sheep egg. She proves that the cell from the adult had lost none of the genes needed to build all the tissues of a sheep. Spemann's egg-tying experiments. Many years earlier, the German embryologist Hans Spemann demonstrated the same truth. He used strands of baby hair to tie loops around fertilized salamander eggs. Although the egg half with the nucleus began cleaving normally, the other side did not begin cleavage until a nucleus finally slipped through the knot. So long as the egg was tied so that both halves contained some of the gray crescent, the second half began normal cleavage and ultimately produced a second tadpole (right). Even after 5 mitotic division of the zygote nucleus (the 32-cell stage), the entire genome was still available in each descendant nucleus. So how do the various differentiated cells come to express the appropriate subset of tissue-specific genes and not all the genes of the genome? Spemann's egg-tying experiments provided a clue. When he repeated his experiments with the fertilized egg constricted so that all of the gray crescent lay in one half, the final results were quite different from what we saw above. The half lacking the gray crescent but containing the nucleus began cleavage right away, yet it never developed beyond an unorganized mass of intestinal, liver, and other abdominal cells (left). The other half, even though it did not get a nucleus until the fourth mitotic division on the cleaving side, went on to form an perfectly normal embryo. This again was proof that the nuclei, here at the 16-cell stage, had not lost any genes. But why, then, did a normal embryo fail to develop on the side with the original zygote nucleus? The distribution of the cytoplasmic contents — mitochondria, RNA, ribosomes, yolk, etc. — in the amphibian egg is not uniform. Shortly after fertilization, some of the cytoplasmic constituents migrate and form the gray crescent. In Spemann's first experiment, each half of the egg contained all the normal egg constituents because the longitudinal constriction was perpendicular to the gray crescent. However, in the second experiment, the hemisphere lacking the gray crescent must have lacked some essential cytoplasmic materials. So his work provided an early clue that the potentialities a nucleus can achieve are regulated by the cytoplasmic environment in which it finds itself. Now let us bring the story up-to-date. A fertilized egg is much larger than the normal cells of an animal's body. Some (e.g., a hen's egg) are truly huge. The frog egg has a volume 1.6 millions times larger than a typical frog cell. The photo (courtesy of L. M. Beidler) is of a 16-cell frog embryo. This mass of cells is no larger than the original egg. The eggs of mammals are smaller, but even they are larger than their descendant cells will be. 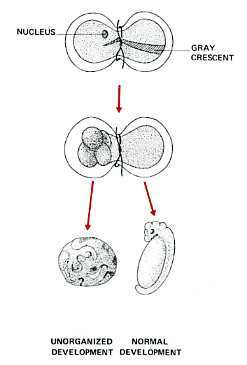 The cytoplasm of the fertilized egg is not homogeneous. It contains gradients of mRNAs and proteins. These are the products of the mother's genes and were deposited in the egg by her. Cleavage of the fertilized egg partitions it into thousands of cells of normal size. Each contains a nucleus descended from the zygote nucleus. But each nucleus finds itself partitioned off in cytoplasm containing a particular mix of mRNAs and proteins. When the frog blastula has produced some 4,000 cells, transcription and translation of its nuclear genes begins (and the mother's mRNA molecules, that up to now have been the source of all protein synthesis, are destroyed — Link). The genes that are expressed by the nucleus in a given cell are regulated by the molecules, mostly protein transcription factors and microRNAs (miRNAs), found in the cytoplasm surrounding that nucleus. Once a cell-specific pattern of gene expression is launched, that cell may release molecules that regulate the genes of nearby cells. In this way, the foundation is laid for the building of an organism with hundreds of types of differentiated cells — each in its correct location and performing its correct functions. During egg formation, molecules of mRNA encoding the protein VegT are deposited at the vegetal pole of the cell. Cells that form there during cleavage translate the mRNA into the VegT protein. VegT is a transcription factor that turns on genes that produce members of the transforming growth factor-beta (TGF-β) family (e.g., activin). These proteins are needed for cells to start down the path to becoming mesoderm. Some of those cells will, in turn, become the Spemann organizer. Later, the Spemann organizer will secrete molecules that induce the ectodermal cells above them to develop into the tissues of the brain and spinal cord. The mother is also responsible for making ectoderm. During egg formation, she deposits mRNAs encoding ectodermin at the animal pole of the egg. Ectodermin interferes with SMAD signaling and thus prevents TGF-β proteins from forming mesoderm at the animal pole. In Drosophila and other insects, cleavage involves repeated mitosis but without cytokinesis (forming a syncytium). So the daughter nuclei remain suspended within the single egg compartment. After several thousand nuclei have been formed, they migrate to the margins of the egg. Only then do plasma membranes form around each nucleus forming true cells. But, as for Xenopus, the genes that will be expressed by those cells are regulated by the cytoplasmic constituents they found themselves surrounded by. And that, again like Xenopus, is determined by where those molecules end up in the egg. For example, Drosophila eggs have a gradient of mRNA transcribed from a gene designated bicoid (bcd). The transcripts are deposited in the egg by "nurse" cells surrounding it. Once within the egg, they are transported (along microtubules) toward the anterior. The result is a concentration gradient of bicoid mRNA extending from a high level at the anterior of the egg to a low level at the posterior. After fertilization, the mRNAs are translated into bicoid protein. High levels of the protein lead to the formation of the head of the larva. Conversely, the posterior of the egg has a high concentration of mRNA encoding the nanos protein, which is needed to form the structures of the tail of the larva. Remove some of the bicoid-rich cytoplasm from the anterior of the fertilized egg and replace it with nanos-rich cytoplasm from another egg. The result: a larva (nonviable) with a tail at each end. Inject the anterior of the fertilized egg with nanos mRNA. The result: another double-posterior larva. coupled to the 3´ anterior-directing signal of the bicoid gene. This causes nanos mRNA, instead of bicoid mRNA, to be deposited in the anterior of her eggs. The result: more double-posterior larvae (on the left). A normal larva is shown on the right. The bright object at the right end of the normal larva and at both ends of the double posterior larva is the tip of the tail. These micrographs are courtesy of Elizabeth Gavis and Ruth Lehmann, in whose lab the third demonstration was performed. The mud snail, Ilyanassa obsoleta, is a small gastropod that lives in mud flats along the Atlantic coast. Like other protostomes, cleavage of the zygote produces daughter cells that are already committed to their fate. In other words, even as early as the two-cell stage, the cells are no longer totipotent. Unlike humans and other deuterostomes, then, identical twins cannot form. In the 12 December 2002 issue of Nature, J. David Lambert and Lisa Nagy reported another mechanism by which two daughter cells become committed to different fates even though they have inherited the same genome. They traced the distribution in the cells of early embryos of the messenger RNAs (mRNAs) encoding 3 proteins that are known to be important in the development of other animals such as Xenopus and Drosophila. IoTld, which encodes the snail's version of a protein called tolloid in Drosophila. as the cell got ready for cleavage, the mRNAs collected at only one of the now pair of centrosomes. They were collected there by traveling along the microtubules that radiate out from the centrosome. As cleavage continued, the mRNAs moved from the centrosome to a spot on the inner surface of the plasma membrane. They got there by traveling along actin filaments. At cytokinesis, this patch of accumulated mRNAs was incorporated exclusively into the smaller daughter cell. establishing the main axes (anterior-posterior; dorsal-ventral; left-right). This is done by gradients of mRNAs and proteins encoded by the mother's genes and placed in the egg by her. It has been discussed here. These are run by genes of the zygote itself.